Fourth Row Center: Film Writings by Jason Bailey: In Theaters: "Warrior"
The chameleonic Tom Hardy (seriously, without credits, you’d never guess that he’s the same actor as the one in Inception, much less Bronson) plays Tom Conlon, who turns up in the film’s opening at the door of his father Paddy (Nick Nolte). He hasn’t seen the old man in 14 years, and it is a strained reunion, filled with tension and little jabs—but Paddy is now sober, and trying to make amends, so all the jabs are coming from one side, and that’s no fun. It is a scene we’ve seen before, but it’s played with a refreshing directness by these two fine actors, and is shot with a moody intensity, the shadows of Paddy’s living room nearly smothering the two troubled characters. Slowly, we piece together their background: Paddy was a mean drunk, abusive to their mother, who finally split 14 years back. Tom went with her; his brother Brendan (Joel Edgerton, from Animal Kingdom) stayed behind with dad. The motives for that decision are not initially clear, since Brendan’s current relationship with his father is barely better than Tom’s. These things will come into focus over the course of the narrative, of course, though it is primarily focused on mixed martial arts, which both brothers are practitioners of. 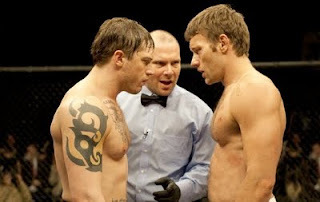 Brendan was once a ranked and respected MMA fighter, though he quit at the insistence of his wife Tess (Jennifer Morrison); however, on the sly, he’s started fighting again, primarily to supplement his meager teacher’s paycheck. Tom, meanwhile, wanders into a gym and ends up sparring with a highly-ranked champ, laying the guy out cold. He decides to try going pro, enlisting his father to train him: “That much,” he tells Paddy, “you were good at.” Early on, we’re told about the upcoming “Sparta” tournament, “the Super Bowl of mixed martial arts,” with a five million dollar purse. One does not have to be clairvoyant to guess where the picture is heading. As it steams towards that inevitable climax, the freshness offered by the performances and naturalistic execution slowly fades. Director O’Connor tries to jazz up the inevitable training montage with some snazzy split-screen, but it’s still a sequence we’ve seen too many times. Tom and Brendan’s long-awaited confrontation is prepared well, but it shoddily written; the skill of the players can’t redeem the clichés they’ve been stuck with. And the initially intriguing arc of Nolte’s character (who slowly begins to reveal the darker side he’s hidden in his sunny recovery-speak) takes a depressingly predictable turn—as we’ve seen hundreds of times before, movie characters are on the wagon for the sole purpose of falling off of it, in appropriately dramatic fashion. The almost-anything-goes nature of the sport makes it inherently cinematic, and the fight scenes are indisputably involving, if kept a bit at a distance (we spend a lot of time with camera outside of the cage, and we want to be in there with them). But there is way, way too much of the TV commentators, who give us the same information ad nauseam (the bouts are almost comically over-explained), and none of the other fighters are given anything beyond a rudimentary sense of personality (O’Connor and co-writers Anthony Tambakis and Cliff Dorman even trot out a Rocky IV-style Russian killing machine, and the characterization is about as subtly drawn). It doesn’t really matter, though; at risk of spoiling an incredibly obvious turn of events, there’s no real suspense in these bouts, because we know exactly where this thing is heading—our two leads, facing off. And O’Connor takes forever to get there; at a flabby two-and-a-quarter hours, the film plays like a first cut, with all of the nowhere scenes and loose ends left in. There are things in Warrior worth seeing, mainly the performances: Nolte’s heartfelt work, Hardy’s no-nonsense approach to his role (I liked how he hustles out to his bouts with no entrance music, and charges straight out of the cage as soon as his work is done), Morrison’s adroit playing of a fairly thankless character, Edgerton’s fierce determination (though his American accent is a little shaky, particularly in that driveway scene with Nolte). There are some good, funny lines, like Brendon’s principal’s reaction to his second job (“This isn’t moonlighting at Applebee’s, for Chrissakes”) and his trainer’s reaction to going for the Sparta win (“We’ve got a better shot at starting a boy band”). And there is some powerful stuff happening in that last fight, which is beautifully underscored by an unexpectedly effective music cue (by the National). At that point, the movie really and finally works, going into weighty emotional territory we haven’t been in a hundred times before. But by that point, it’s too little, too late. "Warrior" opens tomorrow in wide release.